This renowned reference book has served scholars, pastors, students, and those interested in the background of the New Testament for years. The insight given into the Essene community, the destruction of Jerusalem and the interpretations and traditions of the Old Testament in first century Judaism is invaluable. The outlook of Josephus, a late first century Pharisee and historian, on Jesus and the New Testament documents is enlightening and provocative. As an original reference, The Works of Josephus is essential to a full understanding of the first century, the time of Christ and the New Testament. Complete and unabridged, this is the best one-volume edition of the classic translation of Josephus' works. The entire text has been reset in modern, easy-to-read type; numbering corresponding to that used in the Loeb edition has been added to the text; and citations and cross-references have been updated from Roman numerals to Arabic numbers. 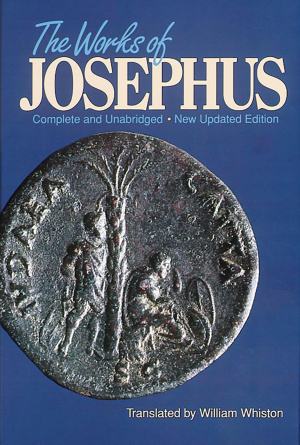 The Works of Josephus by Flavius Josephus was published by Hendrickson in January 1995 and is our 11312th best seller. The ISBN for The Works of Josephus is 9780913573860. Be the first to review The Works of Josephus! Got a question? No problem! Just click here to ask us about The Works of Josephus.